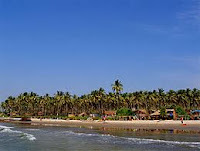 Ashwem beach situated south to the Arambol beach is another isolated beach in Goa where one can see vast stretches of sands until you arrive at a place that has some beach shacks and huts midway along the beach. There are a number of restaurants in the area that serve sumptuous seafood. 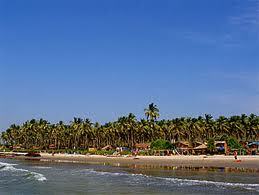 The Goa Ashwem beach has its own idyllic charm and is quite appealing, as it is a very quiet and clean place. Even the waters are safe for swimming. In reality the coastline is one long, palm-fringed delight the powdery sands – usually silver, occasionally dusted Golden – only interrupted from time to time by inlets, estuaries or headland. Whether secluded and peaceful or broad and lively, they exist for all to enjoy for none are private. To get around Ashwem it is best if one hires a bike, as the buses from Mapusa and Panjim are irregular. For accommodation there are some basic huts and tree houses in Ashwem.